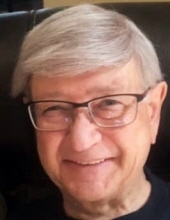 Russell V. Circo, age 79, of Aurora, formerly of Chicago, Oak Park, and Glen Ellyn; beloved husband of Carolyn, nee Wheeler; loving father of Karen Stoelinga and Kenneth (Carla) Circo; cherished grandfather of Madeleine and Katherine Stoelinga, and Nicholas and Jillian Circo; dear brother Mikkie (Gene) Sawyer and the late Mike (Maryanne) DeFrancesco; treasured cousin, uncle, and friend of many. Russell graduated from Loyola University with a Bachelor’s Degree and received his Master’s from the University of Notre Dame. He worked as a Program Director for the US Department of Agriculture until his retirement in 2000. Russell was member of the Silvertones Senior Singing Group, and was an avid gardener and loved to travel. Visitation Thursday, February 7th, 3:00 p.m. until 8:00 p.m. at Drechsler, Brown & Williams Funeral Home, 203 S. Marion St., Oak Park. Funeral Mass Friday, February 8th, 9:30 a.m. at Ascension Church, 801 S. East Ave., Oak Park. Interment private. Memorials to American Heart Association, Attn: Memorial/Tribute Processing Center, 3816 Paysphere Circle, Chicago, IL 60674 is appreciated. To send flowers or a remembrance gift to the family of Russell Vincent Circo, please visit our Tribute Store. "Email Address" would like to share the life celebration of Russell Vincent Circo. Click on the "link" to go to share a favorite memory or leave a condolence message for the family.